The Green Esteem Extended Reach Deck Hook's original design and superb technology can be used to hang a variety of feeders, hanging flower baskets, lanterns, and decorative items. The arm leans slightly forward, positioning your hanging items out and over the side of your deck. The durable weather-resistant finish of the powder-coating will maintain its black color and quality season after season. 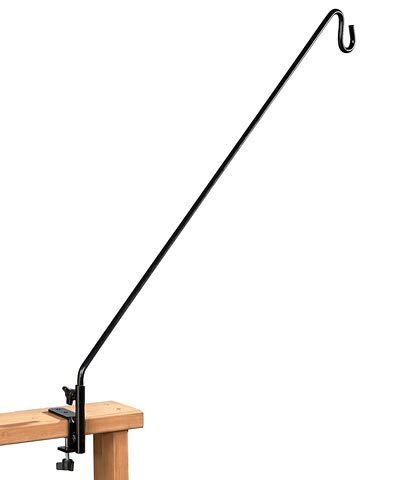 The Extended Reach Deck Hook easily attaches to horizontal deck rails ranging in size from 0.75" to 2" thick, and absolutely no tools are needed. The adjustable hand knob can be tightened and loosened quickly for easy installation and removal.